La Crosse River State Trail is a 21.5 trail along the La Crosse River, a tributary of the Mississippi River here in the La Crosse area. It is one of four state trails; the other three are The Great River, Elroy-Sparta, and the “400” state trail. Together, the state trails cover more than 100 miles. La Crosse River State Trail links the Great River State Trail with the Elroy-Sparta State Trail. An active rail line runs parallel to a portion of the trail. 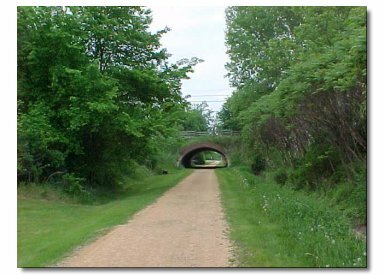 The river trail was developed from abandoned railroad lines from the Chicago and Northwestern Railroad. The trail’s countryside comprises prairies, wetlands, forests, streams, and farmlands. There are also a number of parks and campgrounds along the way. The trail itself is composed of packed limestone screenings and bridges. Bicyclists, hikers, anglers, and other outdoor enthusiasts enjoy the river trail from spring through fall, with snowmobiling and cross-country skiing popular in winter months. Guided prairie tours are available, and begin in Rockland. La Crosse River State Trail connects the villages of Sparta, Rockland, Bangor, West Salem, and Onalaska, from east to west. Sparta is known as the “Bicycling Capital of America” and Rockland is a small agricultural community. Bangor was home to Winnebago Indians and later to Welsh residents. An inscribed sandstone cliff runs along Dutch Creek south of Bangor park. West Salem’s historic locations include the Hamlin Homestead, which belonged to Hamlin Garland, a Pulitzer Prize-winning author, and the architecturally-significant Palmer-Gullickson Octagon Home. Onalaska is surrounded by wooded bluffs that overlook the Mississippi River Valley in the Coulee Region, which is known as a “driftless area” from the time when glaciers bypassed the region. Lake Onalaska is a four-mile wide reservoir on the Mississippi River. The villages that lie along La Crosse River State Trail have a number of amenities for trail trekkers, including bed and breakfasts, motels, bike repair and service shops, and restaurants and cafés. There are more than 100 camping sites along the La Crosse River State Trail which include shaded areas, electrical hookups, sanitary stations, drinking water, hot showers, a camp store, fishing pond, playground, and canoe landing. Veterans’ Memorial County Park & Campground is located between Medary and West Salem. State trail passes and camping permits are available through Wisconsin State Park System. After the success of last year’s event, CenturyLink’s Sand on the Riverfront is back in 2011. The fundraiser, hosted by Riverfront, a nonprofit organization that provides services for the disabled, will take place at Riverside Park in La Crosse August 19-21. Sand on the Riverfront’s theme for the year will be “Sports of all sorts,” which will include a new event for 2011: a 3-on-3 basketball tournament on the 20th. Riverfront handed out awards to event winners in 2010, but with the organization accepting donations, everyone truly goes home a winner. Riverfront has been helping disabled adults find employment and homes since it was founded in 1977 in La Crosse, Wisconsin. Since then, the nonprofit has expanded to six offices throughout Wisconsin, employing almost 300 people to provide constant support for the state’s disabled community. The organization provides training, living support and recreational programs that allow over 1,700 disabled members of the community to live independently and find success in their lives. Admission and registration to Sand on the Riverfront is free, but donations will be accepted and support of the Riverfront organization is encouraged. You can find out more about the Riverfront organization or CenturyLink’s Sand on the Riverfront for 2011 at www.riverfrontinc.org, or by calling 608-784-9450. Don’t miss the fun in beautiful downtown La Crosse! It’s no secret that housing and real estate markets all over the country have been hurting for the past couple of years, but there are areas that are improving and even showing evidence of growth. La Crosse, Wisconsin is one of those areas that continues to thrive, despite being in a recession. La Crosse has exciting housing trends, as well as plenty of spacious and comfortable living options to offer new home buyers. In 2011, the La Crosse housing market has seen a sharp increase in median sales price. In January of this year, the median price was $125,500, but in just six months that number has risen to $143,000. With the median sale price climbing, potential home buyers should be encouraged to look for their dream home in the La Crosse area during the remainder of 2011. Home sales in the area are down from a year ago, but considering that first-time home buyers in La Crosse were supplemented by the Federal Housing Tax Credit Program in 2010, the drop off is not a real setback for the market. In fact, home sales actually increased from May to June, showing that there may be more growth to come later in the year. The declining unemployment rates in the area make La Crosse real estate a stronger market. According to the Wisconsin Realtors Association, the housing market should receive a healthy boost with more residents working. The state of Wisconsin’s unemployment rate is under the national average and with 25,000 jobs already added this year, things are definitely looking up for the state, the area of La Crosse and for Wisconsin real estate in general.